Through the first half of the nineteenth century, Italian art was dominated by an acute awareness of the artistic glories of the culture’s distant past. This legacy weighed heavily, fortifying and extending the life of neoclassicism, the eighteenth-century revival of ancient Greco-Roman aesthetics and ideals, as in no other country, well into the mid-1800s. Neoclassicism’s preference for themes from antiquity and measured, rational style are evident in prints and drawings along the left wall of the room pictured here. The artistic preeminence of Italy during the Renaissance and baroque periods was an equally inescapable memory, revisited in the early 1800s in a last great moment of engravings after the masterpieces of those eras. Mauro Gandolfi’s translation of the sixteenth-century master Correggio, on the wall in the middle of the room, is a superb example. Art academies across Italy, whose institutional authority went unquestioned, guided and promoted this retrospection in the training of their students. At the same time, theater design and topographic views, having taken shape and flourished during the previous century, adapted to new challenges—the rise in popularity of melodramatic opera and the ever-expanding number of tourists desiring souvenirs. The significance of the one can be gathered from examples along the right wall, the other in the two grand panoramas at the far end of the room. New directions in European art of the period—romanticism, realism, naturalism—did reach Italy, but were never expressed as autonomous styles. Instead, they became subcurrents within the prevailing traditions, from the personalized neoclassicism of Fortunato Duranti to the sublime scenography of Antonio Basoli to the evocative landscapes of Carlo Bossoli. This unusual subject derives from a late seventeenth-century French novel in which the adventures of Telemachus, son of the Homeric hero Odysseus, serve as an allegory of education and the path to good governance. 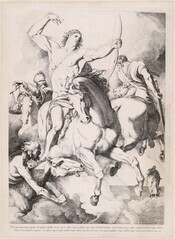 An early work by Pinelli, this vigorous drawing, with its knowing references to ancient statuary, reflects his training and early activity as a sculptor. Pinelli would go on to become a prolific illustrator of both classic texts—such as his illustrated Dante also featured in this exhibition—and of scenes of contemporary Roman life, featuring an elegant, almost purely linear style. The leading neoclassical painter in late eighteenth-century Florence, Sabatelli went to Milan in 1808 and became an influential professor at the Academy of Fine Arts. Upon arrival he undertook an ambitious project to interpret the Book of Revelation, a measure of artistic imagination ever since Albrecht Dürer published his famous series of woodcuts in 1498. The six resulting etchings, in a style combining meticulous draftsmanship with visionary fervor, remain Sabatelli’s most significant work as a printmaker. This plate illustrates some of the most famous verses from Revelation (6:1–8), which describe the opening of the first four of seven seals and the subsequent emergence of the four horsemen of the Apocalypse. They represent, from left to right, death, injustice, conquest, and war. This drawing is virtually identical in scale, composition, and detail to the etching by Sabatelli on the left. On the one hand, this drawing cannot be a copy by another artist because the hand and quality are perfectly characteristic of Sabatelli. On the other, if the drawing had preceded the print as a preparatory study, one would expect to find slight differences between the two and the drawing’s orientation most likely would be reversed. Instead, the drawing appears to be one of numerous repetitions of both individual motifs and entire compositions that Sabatelli created for the many admirers of his draftsmanship. Pinelli’s late work was devoted to illustrating narrative texts, both ancient and modern, in a polished, linear style that represents his own variation on neoclassicism. One of his major projects was the illustration of Dante’s Divine Comedy in three folio volumes composed of 145 plates (1824–1826). This plate from the Inferno combines the scenes of the poet’s encounter with a leopard, lion, and she-wolf upon his descent into hell and the subsequent meeting with Virgil, his great precursor and guide, who warns, “You must go another road, if you wish to escape this savage place.” Pinelli’s swift preparatory study, on the left, determined the basic arrangement of the composition. Correggio painted the so-called Madonna of Saint Jerome in the late 1520s for the church of Sant’Antonio, Parma. Ardently admired through the first half of the nineteenth century, it was engraved dozens of times. This print is usually judged to be the most successful at conveying the painting’s subtle tones, suffused atmosphere, and gentle sentiment. 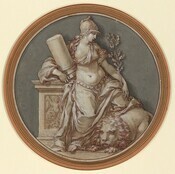 Gandolfi, the last figure in an important family of Bolognese artists, undertook this version at the behest of Giuseppe Vallardi, a leading dealer and collector in Milan who also composed the accompanying verse. The title of this print comes from the artist’s inscription along the lower edge. The scene apparently takes place in an antique setting, indicated by the statue on a pedestal, the temple facade, and the horse-drawn chariot at right. The connection between the inscription and this subject—like that between the disciplined composition and the agitated handling—is, however, difficult to ascertain, as is the allegorical meaning itself. Duranti’s work consists largely of such idiosyncratic, often strangely expressive drawings. Alessandro Manzoni is generally regarded as the greatest Italian author of the nineteenth century and his principal work, the novel The Betrothed (1827), is a cornerstone of the modern Italian language. Even before its publication Manzoni had achieved fame with The Fifth of May, a lyrical poem composed upon the death of Napoleon in 1821. Its success was the inspiration for the sculptor Gaetano Monti’s marble relief portraying the author in the idealized neoclassical style made fashionable during Napoleon’s annexation of Italy (1805–1814). 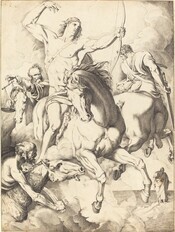 A quarter century later, Cornienti, an academic engraver, translated Monti’s portrait into this, his best known print. A painter of oriental themes and an occasional printmaker, Biseo created this etching in tribute to the eighteenth-century artist Giovanni Battista Piranesi. The subject (an ancient Roman monument overtaken by time), the deep perspective, and the density of line all pay homage to Piranese’s etchings of Roman ruins. The print testifies to the long and powerful grip of the past on the Italian imagination into the twentieth century. This unusually large and detailed study shows the celebration following Alexander the Great’s defeat of the Persians. The king and his consort, Campaspe, sit enthroned on the left as the court musician, Timotheus, performs before them. Fancelli, a professor at Bologna’s academy, plotted the scene’s perspective, the poses of individual figures, and even architectural ornament with equal precision, writing extensive notes about them on the right. Fancelli’s late work included painting theater curtains. 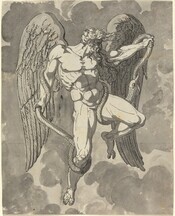 The large size of this drawing and its musical theme suggest that it was a preparatory study for such a project. Basoli specialized in imaginary landscapes and architectural fantasies, which frequently served as set designs for theatrical productions. Here, at the early stage of such a design, a cascade sweeps through an imaginary city and, it seems, collapses a bridge in the foreground at right, leaving tiny figures gesturing in amazement. Darting pen strokes and bold washes further enliven the scene and intensify its drama. Basoli’s prints are typically classical in inspiration and polished in appearance. This drawing captures a more restless, romantic aspect of his art. Gaetano Donzetti’s opera Lucia di Lammermoor (1835) comes to its tragic conclusion when the protagonist Edgardo learns of the death of his beloved Lucia and takes his own life. Liverani, the leading scenographer in the Romagna region of northern Italy, created the designs for the opera’s performance in Faenza in 1868. The complex architecture and pronounced perspective of this study for the stage set maintain the tradition of eighteenth-century Italian stage design while introducing an appropriately somber mood through neo-Gothic architecture and dark tones. Balaklava, part of the modern city of Sevastopol, is a fabled historic port on the Crimean Peninsula. Bossoli, who grew up in the area, has here transformed the surrounding landscape into one of fantastic sweep, idyllic beauty, and poetic resonance. Bossoli specialized in such romantic elaboration of both exotic and familiar locales, enjoying considerable success with collectors of the period. Like the large-scale watercolor of Lago Maggiore by Salomon Corrodi (previous slide), this watercolor demonstrates the continued vitality and appeal of the eighteenth-century Italian tradition of topographic views.